The child safety lock is provided to help prevent children from accidentally opening the rear doors from inside the vehicle. The rear door safety locks should be used whenever children are in the vehicle. 2. Push the child safety lock (1) located on the rear edge of the door to the lock position. 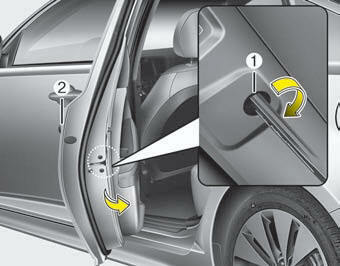 When the child safety lock is in the lock position, rear door will not open even when the inner door handle is pulled. 3. Close the rear door. To open the rear door, pull the outside door handle (3). Even though the doors may be unlocked, the rear door will not open by pulling the inner door handle (2) until the rear door child safety lock is unlocked. If children accidentally open the rear doors while the vehicle is in motion, they could fall out and be severely injured or killed. To prevent children from opening the rear doors from the inside, the rear door safety locks should be used whenever children are in the vehicle.